One of the things I love about baking is seeing people enjoying eating my baked goodies. The most appreciative bunch of people has to be hungry runners from my running club after a cross country race! 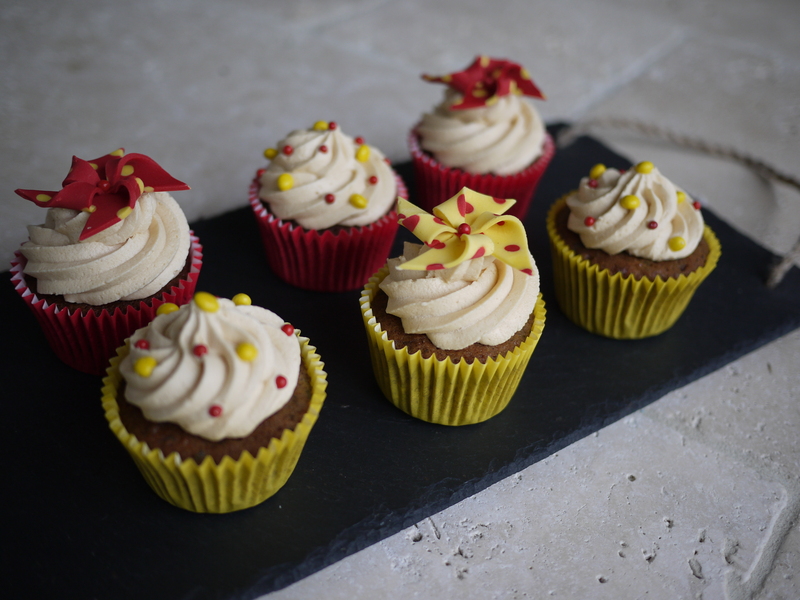 I usually try and bake something red and yellow (Serpentine Running Club colours). 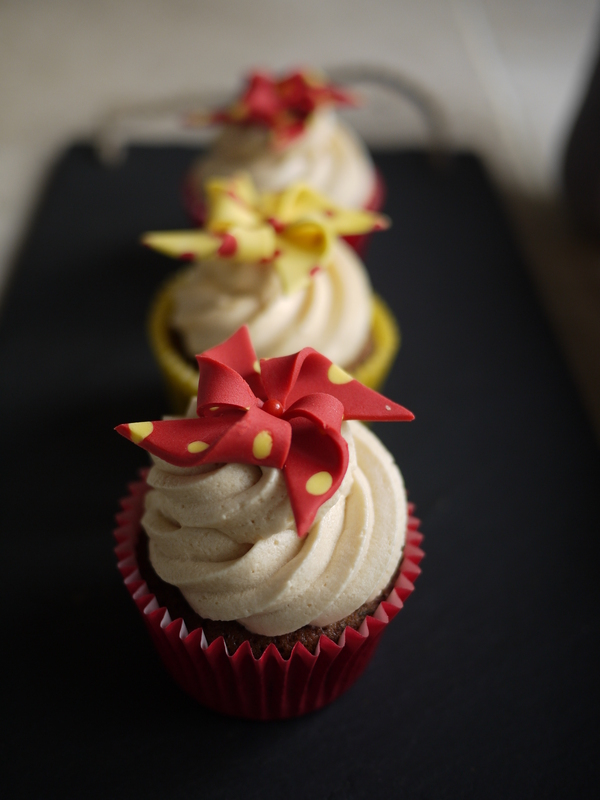 This week I decided to do some pinwheel cupcakes. I didn’t think they would take too long and they would have been very quick if I hadn’t had made them spotty. But it was a rainy day, so what better way to spend it than decorating cakes! Preheat the oven to 180 C. Line 2 12 hole muffin tray with 16 cases. Place the chopped dates in a bowl and pour over the boiling water. Leave to soak for 20 minutes. Add the vanilla extract. Cream the butter and sugar in a mixing bowl until light and fluffy. Add the eggs one at a time scraping down the sides of the bowl and mixing well after each addition. Sift the flour, baking powder, salt and bicarbonate of soda into a separate bowl. Add the flour mix to the butter, sugar and egg mix in 3 separate batches, keeping the mixer on medium high until the batter is smooth. Add the date mixture and mini fudge pieces and fold in by hand ensuring it is well mixed. Fill each case two-thirds full, bake for 15 – 20 minutes until the tops are golden brown and spring back to the touch. Remove from the oven. To make the buttercream, using the electric whisk or freestanding mixer with the paddle attachment, whisk the icing sugar with the butter on a low speed until fully combined and the mixture is still powdery in texture. Gradually add the milk and, once this has been incorporated, increase the speed to high and whisk until light and fluffy. Add the caramel and continue to whisk until it is well mixed in. Put the butter cream into a piping bag with a star nozzle and set aside for later. While the cakes were cooling I made the pinwheels. 1. Roll out a small piece of red and yellow fondant to about 3-4mm thick. 2. Use a piping nozzle to cut out a line of evenly spaced circles from the red fondant, using a small paint brush to poke the fondant gently out of the nozzle. Keep the mini circles as you’ll need them to put into the yellow fondant. Then do the same with the yellow fondant. 3. Using a small paint brush very lightly dampen the inside of the holes you have just cut out and carefully place a mini circle of the opposite colour into each hole. 4. When you have done the row press the circles to make sure they stick. 6. 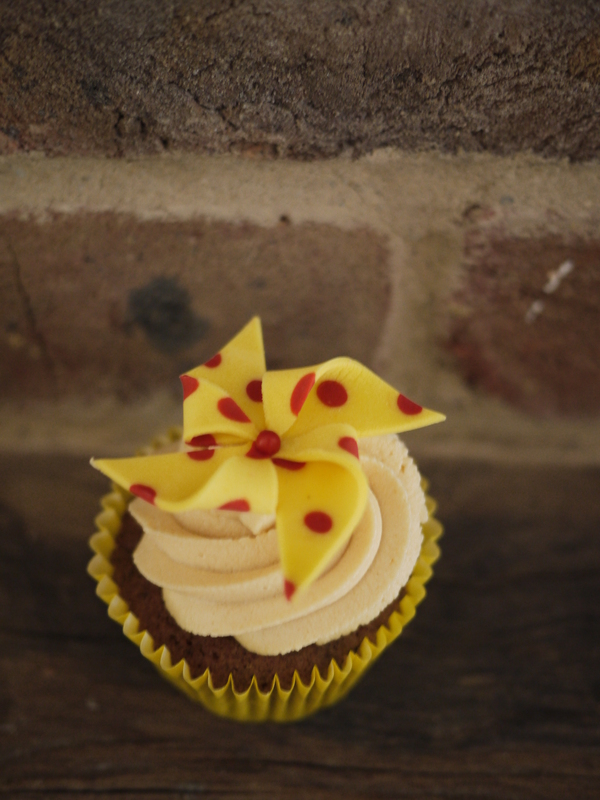 Once you have a completed spotty area, carefully roll out the icing so it is about 2mm thick. This should help flatten the circles into the fondant. Try to apply even pressure with the rolling pin so that the circles stay circular, too much pressure in one area will distort the shape. 7. Then cut out squares about 4 am across. Cut diagonally in from each corner about 1.5-2cm. Dampen the centre of the square and folded half of each corner into the middle as in the pictures. Then place a red ball in the middle of each. Leave them to dry before decorating. 8. 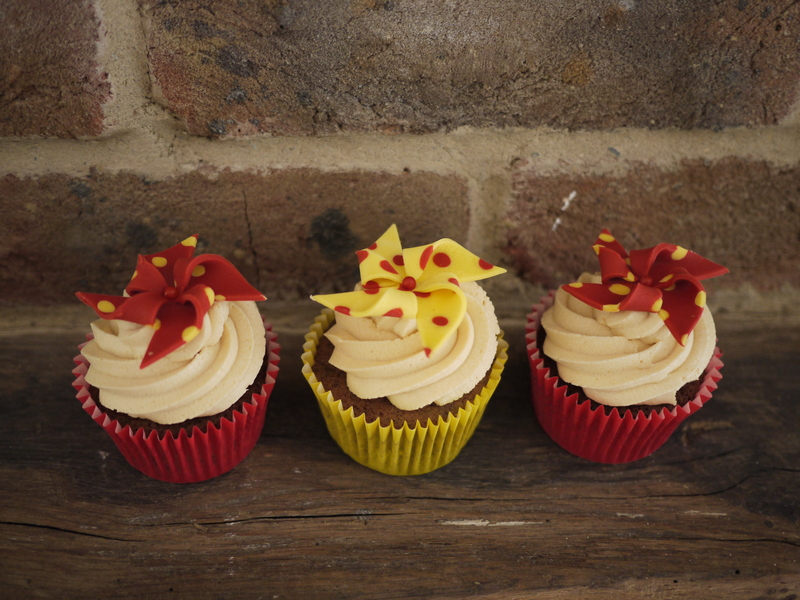 Once all the pinwheels have been made and have dried out, pipe swirls of butter cream onto each cupcake and added a pinwheel to the top.